Arsenal boss Arsene Wenger has blamed the media for causing a row with Chelsea's Michael Ballack following his team's 2-0 defeat at Chelsea on Sunday. Wenger claims he was misreported by the press and insists he was "full of compliments and praise" for Chelsea. "I find it completely unfair, you take one word of my press conference to turn it around, every time. "You did it at Villa, you did it at Chelsea, but every time I was positive towards the opponents," he said. 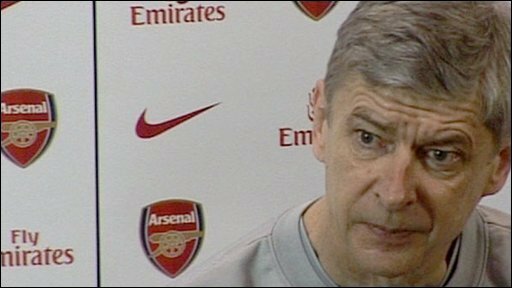 "If you want I can say nothing in my press conferences, don't worry," warned Wenger. Ballack was unhappy with Wenger's comment that "we didn't get a demonstration of football" from Chelsea in Sunday's match. "Wenger always says things like this when he loses to find an excuse," said the Germany captain. But the Arsenal boss responded: "I am long enough in England to know that the team who wins can say what they want. They are right. "It is my job to take a distance from that and analyse the game in a calm way with a cool head and to analyse what is right." "I have to live with all the conclusions that Chelsea are a much better side, but I believe what I believe." Chelsea midfielder Ballack also labelled Arsenal one-dimensional, saying: "We knew the way Arsenal play. It is always the same style." "Football is not possession of the ball and playing a nice pass - football is about winning games. Wenger quoted statistics about possession and about how Chelsea's greater experience allows them to know where and when to commit fouls. Like his Arsenal team, he will have to do much better than that. "That is what Manchester United showed when they played them and what we did. "We derived the win because we were very effective, and that was our strategy." Ballack, who joined Chelsea from Bayern Munich in 2006, believes the title race is now between the Stamford Bridge outfit and Manchester United. Chelsea's victory on Sunday put them two points clear of Manchester United in the Premier League table, and nine in front of the Gunners. "If you look now, it seems like a race between Manchester United and us. But four weeks ago, you could see how it was [different] and it can go quick when teams lose points," the 33-year-old added.